Well, I think I have figured out a way to tell them apart when they get to be the same size. The whites on their bellies are slightly different. On the baby, the white nearest her neck has an outline edge like a V and the older sister's looks more like a W. Maybe I can come up with names what start with these letters to help me remember how to tell them apart. The older sister has overcome the fear of my shoulder. She now comes out of the cage, after some coaxing, and wanders up my arm to my shoulder. But she isn't satisfied to sit there. She is constantly looking for other places she can go. She is very curious. Guess that goes with the young age. And she almost still popcorns. The baby loves the tube and has redecorated it to her likings. So far no food has been brought in there that I can see. After the cage door has been open for a while and she hears the goings on, she decides to come out too. She seems to be concentrating more on the ability to get to the top of the cage. But so far, she hasn't figured out how to do that. She has more curly whiskers than her sister. They both know my voice. When I open the door to my office, they freeze. I wait to see what they do, but they don't move. Then I say something to them and they get excited. That is a great improvement. And no biting has happened here and I don't think it will unless I am careless offering a food treat which is when most of our furry friends "accidentally" get us. As World Rat Day approaches, I get more excited. I am excited because more and more each day these little girls show signs of trusting me more and more. Yes, I know, I have said more and more a lot - but it's true. For instance, when I open their cage door to let them out and explore, I lean on the table to be closer to them as they emerge from their world into mine. Slowly and cautiously they approach the open door. But the more I speak now, the faster they come. The baby is the most curious and brave. She is the first to explore the domain of the human world. Or wishes to extend her own. Since I am leaning on the table, it leave me vulnerable to whatever they care to do to me at the time. Mostly I get groomed. Today the older sister decided to give me a kiss on the tip of my nose. That felt so good. The older sister does the same thing to me every time when she first comes through the door. She comes up to my face, she stands up on her back legs, nice and tall, and places her hands on my head. Since she is so tall her little hands end up above the glasses that I have on the top of my head. It a split second she pulls them down to my chin and then backs away. The look on her face is one of triumph as if she has conquered the impossible task once again. And then, just as quick, she is off exploring. Today, the baby found that going up one arm to my neck, under my hair and then down the other arm to the table and back up the other arm was great fun. She did this a couple of times while the older sister watched. She finally got up the nerve to follow her little sister and they did this countless times playing follow the leader. 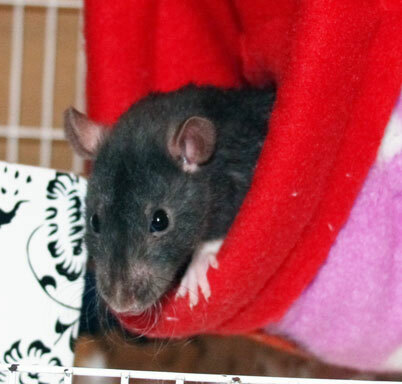 I put one of the Comfy Cozy Rattie Bags I make into their cage. They love going in and out of it. But now when I go into my office, I find that they have tried to turn it inside out. So I put it back to normal and they get excited all over again. What a pair of clowns. I recently heard from the person I received these two girls from. It seems she also rescued the Mother, who was pregnant yet again. Being that she was rescued from a snake food breeder, I guess this isn't too surprising, just very sad. 8 days ago she gave birth. She has been a wonderful Mom but seems to want out from time to time. So this person has been putting her back in with the other girls she has and that was ok for the first few times. But now, when this person goes to pick the Mom up to put her back in with the babies, the Mom rat tries to bite her and has actually succeeded a few times. But once she is back in with the babies, she is very good with them. What should she do? Should she leave the Mom with the babies until they are older or should she continue to let the Mom visit the other rats and just live with the possibility of being bit? Could it be a hormone thing? I suspect that the little girl we call Baby, for the lack of a name yet, is pregnant. Is that possible? She seems even bigger today. I was told by the person who rescued her on St. Pat's Day that this little baby girl was in a cage with 30+ other babies about her age. But these others were harassing her and pulling her fur out. Remember I asked earlier about a hairless gene in a rat in regards to these two girls? Well, the hair pulling was why her fur was a little sparse and not a hairless gene like I thought. The breeder, believing she was helping this little one, put her into the cage with her Mom, Summer. Unfortunately in this cage was also a PEW male whom they wanted to mate with Summer. So, we are wondering if a baby, our little one's age, could be old enough to get pregnant. She seems to be awfully young to have this happen. I have been searching the net and talking on the RatsPacNW newsgroup asking for help on this and what to expect. Many kind people have responded and have offered to help more as/if the time gets nearer. I really appreciate all of that. 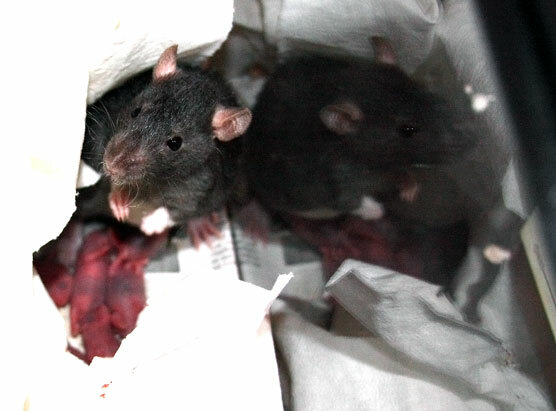 I have never had a rat who has had babies before. I took the baby to our vet, Dr. Diane Mitchell, DVM, with her sister. They have bonded so well that I thought it would make it a little less stressful if the baby was with her sister. I was nervous about how they would react outside of the carrier. I wasn't sure if we had bonded enough yet for them to look to me for protection. But I got my answer pretty quickly when Dr. Mitchell let go of her and she ran straight to me. This little girl has found shoulders and hair to be safe so she really enjoyed Dr. Mitchell's shoulders as her hair is thicker and must resemble more of a forest to her than mine does. We were able to view the X-ray while Baby was safe and sound in this forest and was peeking out at what we were doing like she was listening. The x-ray showed the possibility of little bones in the uterus. At least, we were pretty sure it was the Uterus. But Dr. Mitchell was puzzled at the timeline and the little amount of calcification of the babies bones, if that is really what we were seeing. We couldn't locate the information we needed on when the baby bones calcify. So, were these babies we saw and they weren't calcified enough to pick up on the X-ray? Could she have been gotten, but the eggs not fertilize until a few days later? I know human sperm live a while in the body of a woman, so does the rat's work the same way? That may make a 5 day span actually be a 7 day span? Another thought Dr. Mitchell has is that after all the trauma this little one has endured, maybe her body is reabsorbing the babies. 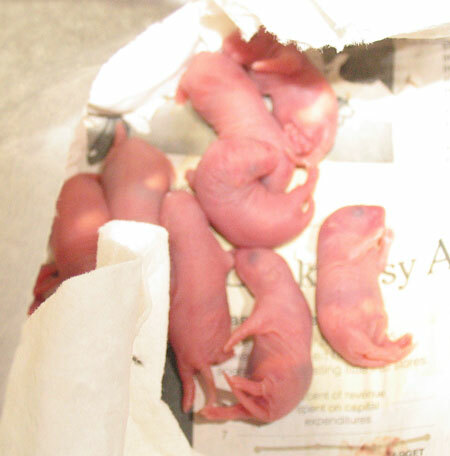 Has anyone had an experience of a rat re-absorbing their babies? Can a first pregnancy, especially to one so young, be late? And if so, by how long? So, I guess time will tell, eh? In the meantime, we have the aquarium set up and ready for her. If she indeed looks to be pregnant in the next couple of days, I will move her into it so she can get comfortable and maybe set up house. I don't believe she was ever offered up to a snake in an aquarium like her sister was, so I hope she doesn't mind being in one. I don't have a cage that the babies wouldn't get stuck in so an aquarium will have to do unless I can come up with another idea. I just had to tell this story before I forgot. I took a few small movie clips of the older sister doing this but they came out a little dark. I will see if I can edit them. I have their food bowl in the back left corner of their wire cage. I noticed they were out of lab blocks so I wanted to put in more. But it is a pain to reach in at the angle I would have to be in order to get them in the bowl. The older sister came to the opened door as usual looking for attention. I offered her a lab block and she scurried away with it as if it was a valued prize. She went to the back right with it and I thought she was going to eat it there or bury it. But to my surprise, she made a left turn and headed straight for her bowl and plopped it in it. Then she scurried back to me with the look, "Please Mam, I want some more." So I gave her another and she did the same with it. She did this 10 times! As the later ones plopped into the bowl she started to pat them with her from paws and then rearrange them to make them fit better. What a funny sight. I enjoyed every minute of it. Later I caught Baby taking the carefresh litter and patting it in place on top of the food bowl neatly covering the food so it couldn't be seen. Well, I went to bed really early this AM. Nothing new for me. But I went to the Democratic convention today from 9am to 6:30pm. How tiring. I had my husband text me every hour to let me know about Baby and if she was ok. I was afraid that something might happen with her while I was away. But all was well. At around 12:30am (April 6), I just had the feeling I had better set up the aquarium and separate the girls. I saw no nesting signs from Baby, but something inside just told me I should get her ready and used to her new digs if/before the babies come. By 1:30am I left her settled after giving her a lot of attention as well as her sister. The older sister will be the one to have separation anxiety as she was that way before the rescue Mom put the little sister, Baby, in with her. But the older sister now loves to come out and bound up to my shoulder and hide under my hair. I am glad I was letting my hair grow out. At noon, we slept in this am, I went to check on her. And there are 9 pinkies in with her! How wonderful. And Baby looks great! Bright eyed, wanting to come out for attention, yet protective when I moved the paper towels. But she was just being near them, she was making no moves to bite me or anything. I just counted them and then moved the towels back the way she had them and left her along. Ok, I also took a quick pic of them too. Fortunately she is used to that so it didn't seem to bother her. Here is this first pic of them - it looks a little odd as there is a reflection that caused the photo to look like there are two sets of mommies with babies. Now I need all the advice I can get on what to feed Baby, what to expect, how to tell if the pinkies are getting enough milk, ect... Please email me with all your expertise for those of you readying this Diary. 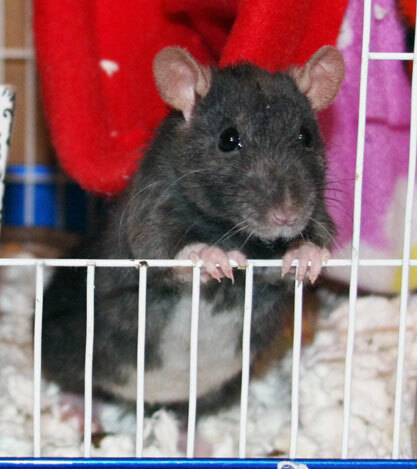 I would really appreciate it - mdkarr@rattiewordocomfort.com. You can see EARS! 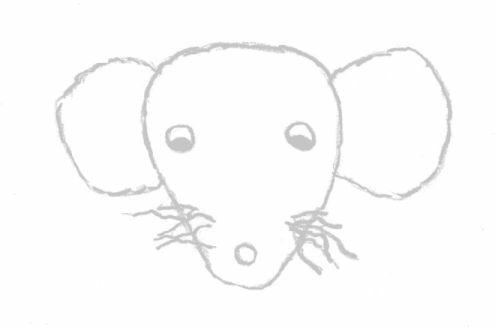 And Whiskers! And I think I will have a Black with a white blaze or something like a reverse hoodie? I also have the two hoodies close up. I guess there are actually three, but one of them is more black than white. They are so cute and Mom spent some time with her sister today. And guess what?! She knew how to use the wheel. It was so funny. I saw her getting interested in it so I scooped out all the litter the older sister put into it. Then Baby got right in and started running. The older sister, who had been watching me remove her artwork, looked on as if to say to herself, "Is that really what it is for" or Mom is going to be so mad at you, you broke it now - it won't stay still anymore." And Baby was so active. Even though I have a lot of different food types there, I didn't offer her scrambled egg this morning. So I went and cooked some up and put it in and she pounced on it in less than a second. Once she finished, she quietly returned to her babies and slept with them for a little while until they woke up looking for their next meal. I think the older sister is enjoying her time with me. She now knows how to climb out of her cage onto my arm, scurry up it to my neck and then stand tall as if she is part Meerkat. I may end up moving my ratties in my office back into our bedroom. It seems MY baby, my oldest daughter, is coming back home to stay for a while. So to give her some privacy, I may clean out my office and let her have that as a bedroom. We will see. It may be a good thing as my bedroom is already set up for a rattie rumpus room. At least the bed is. That may help Mom to get out her extra energy. Aww, I took Baby out today. All she could do was lick me. She would scamper from one shoulder to the other and then lick a finger. Scamper to the other shoulder and lick a finger. Very strange, yet very cute. I put the sisters back in the older sister's cage again and the tussling immediately started. But it quieted down in a minute. I proceeded to take the babies out in order to change the cage. I didn't put them near Baby since she really seemed to have a fit last time. And when I put her back when I was done, she didn't do the running around the cage with a baby routine. She just wanted back out again. I was in my office a lot today and I was listening to the babies. They are louder when they want food and quiet up real fast when Baby settles down. So, I thought of two names. I don't think I could come up with the V and W like I wanted. So I just went by what I was feeling about them. So what about Roxy for mom and Vicki for the older sister who so victoriously survived the snake, twice. Oh, and the older sister was very cute today. She has developed a neat way of showing affection. At least that is what I am taking it as. She too runs from shoulder to shoulder, but when she gets near my face, she rubs her face against mine. She even licked my cheek. But she did the face rubbing thing many times. I am hoping she will get used to being held with the understanding that I will not be feeding her to a snake but offering Love and protection forever. I have names for my girls! Baby will now be Willow and the older sister will now be called Dawn. Willow because it is a beautiful tree with many lovely fronds that bloom in spring, just like her new babies and her becoming old enough to be a lovely mother. Dawn because every morning is a new birth of the world and Dawn lived through two life risking moments of her being snake food and lived to start a new life with us. Both are really getting used to sitting on my shoulder and actually love to come out and play. I did find out who was the one that would turn the bag in the cage inside out. I had Dawn in my lap on the sofa and had a snuggle bag around my neck. She was climbing into it and out of it again. Then she was getting bored I guess and going inside it, grabbing the inside corner and trying to pull it outside of the bag. Silly girl. I wonder why she was doing this. Any ideas anyone? As for Willow, I know know how to pick her up. She actually stands in a certain spot and stands up on her hind legs for me to grab her under her arms and around her waist. She doesn't kick her legs everywhere trying to grab on to something. She just hangs there while I take her out until she gets to my shoulder and then she scrambles behind my neck under my hair. I had them in Dawn's cage for a while and they did their wrestling routine. After a while it was Willow who was playing tag with her sister. But as soon as I started to putz with the babies cage Willow immediately stopped and started to chew on the bars of the cage. Dawn tried to play some more, but Willow wanted nothing to do with her. Willow is really a very good Mom. I just took a walk along memory lane. Of course, it is mostly short term memory. But I just compared the photos of these babies from Day one to Day Nine and the changes are amazing! Even the changes from Day Five to Day Nine. I was worried that I would have many of the same images in the days of pics. But when you look at all of them together as I just did, you can really see the changes in their growth. I feel bad about something that happened today. They have definitely gotten more active and it surprised me. While I was holding one just above the seat of the chair while getting the box ready he/she squirmed out of my hands and fell to the carpeted floor. I watched him at first to see if he was hurt. He/she just sat still as if stunned. I picked it up and cupped my hand around it for warmth and then watched him. After a moment, he started to move around again. No obvious sign of injury. I put him/her back in with the others and he/she (can't wait to know for sure what they are) dug its way under the rattie pile. I watched for a while and it seemed to be doing fine. I checked back later, many times, and it was still doing ok. It is one of the two shiny coated ones. I just feel bad that it happened. So now I have been warned that I need a different way to do things. I think I will get a box for the floor and have it all ready before I start taking them out to change the cage. I had even thought of getting a box with higher sides this time cause I knew they were squirmy. The white fur on the hooded ones is getting really white now. And the dark ones are three different shades. Two of them are a shine coat and two of them are a slightly lighter grey. And fortunately all the grey ones have noticeably different stomach markings. Phew! One of them even likes to be on his back in my hand while I gently rub his stomach. he/she acts like a crocodile and almost fell asleep in my hands. So it looks like it is going this way - There are two shiny coated dark grey kids, two lighter grey coated kids, two dull coated dark grey kids, two hooded kids and one in between hooded and all dark. I guess he/she couldn't make up its mind. Today I had Willow out with me on the sofa. She is just so curious and is well aware of her surroundings. But today she was startled. We have a few cats - all but one I would trust and have trusted with my rats. Hissy, our fattest girl was asleep behind me and not moving. I watched as Willow discovered the presence of Hissy who was not moving as she was sleeping. It is amazing how self preservation is such a strong instinct in these little creatures and how they know instinctively what and who to be afraid of. I could tell the moment she smelled Hissy. Her body stiffened and she became really still. And then all of a sudden she turned and ran to me and hid under the carry bag. That made me feel good only because she feels I will protect her, which is true of course. But she trusts me. That meant a lot. So I pet her for a while and talked with her. But she remained stiff so I took her back to her cage. It took her a short time to come out of the bag and then she ran straight to her babies. She is such a good Mom and I am so proud of her. I was late in getting these up. We had snow here! We all can't believe we did. It is ridiculous. This winter I believe I got to make 4 snow people. Albeit, they were only about a foot tall, but it is just something I do to mark the snow here. The babies are now wandering around the cage. But not too far from one another yet. Just enough to actually be separated and not touching one another. Then they take a few moments in that position and wander back to the rest to join the pile. They are actually breaking off into groups rather than being one huge pile. I would imagine with the weight they are getting to be, that many would be too hard on the bottom guys. And also, their body heat is more now that they are larger and Oh so cute. They are even getting personalities already. Some are more explorative while others stay close to home and Mom. Others when you hold them move around more in your hand, while some just sit there and love the petting. I a few days I will take pics of each one - back and stomach and post them for identification purposes. I am also hoping to find out if they are boys or girls. I believe there is at least two boys so far that I can tell. But we will see. I noticed that one or both of the dark shiny furred ones have almost what you would call a ping sound. It is a sound it sends out almost like a locator sound to find Mom. It is a cute sound. And he/she only does it when I disturb them and it is away from the others. Wow, the babies are starting to clean themselves. They are so cute. They sit and clean their faces and their feet. So far, I haven't seen them clean one another. And there is one Rex Boy that is a wanderer. He is the licker and is a curious boy. It was funny at one point. This little boy was wandering at feeding time and twice Willow had to start walking, detaching some suckling babies along the way, and then picking up this little boy and brining him back to the pile. And two are lickers - one Rex and one hooded. One is restless and doesn't like to be held too much. The rest are pretty comfortable being held. 6 of the Babies eyes are open! Now they can start wandering and actually see where they are going. "Crescent", the hooded girl, is pretty strong when suckling. She was holding on to Willow when she decided to leave the nest. Once she let go, she was able to turn around and make it straight back to the nest of siblings directly. Very cool. I have given a few of them names for identification - Crescent and J. They are identified on the Baby ID page. Wow, the babies are everywhere. And I believe they can hear me now. I came into the room and Willow was eating away from them. They were awake cleaning themselves and just hanging around. I watched quietly for about a minute. But as soon as I said something all their little heads pointed in my direction. It was a funny reaction. I took them into my bedroom in a high sided box. I had already set up a table top photo box with some lettered blocks that are supposed to be for parrot treats. But they are small like the babies. Two of them just didn't want to stay in there. They kept walking out of the box and onto the bed. I had to keep counting after each shot to make sure I still had all of them there. finally I put some back in the high sided box while I took pics of 1 - 3 at a time. They are certainly a challenge to photograph now. They don't stay still. This time of photos gave Willow an hour with her sister today. I believe she enjoyed the time away. I offered some my finger after I dipped it in some Ensure. Only one decided that he would hold my finger with both of his little fingers while he licked my finger clean. Because they are everywhere, Willow can no longer move away from them for a break. I had gotten a wooden igloo type housing but I didn't want to use it before because I was afraid of a baby getting forgotten. But now it is great as Willow can jump to the top of the housing and get a break from them for a while. I will start offering the babies some foods that have been suggested for the little ones to help ease Willows time with the babies. I won't rush it, but I will offer the food and lower the water bottle too. Fortunately I have the little bitty bowls used for sauces in oriental cooking mostly. They almost look like little creme brulee bowls. These are perfect for the little ones as I know they won't get in trouble with them since I can't fill them too much. The hooded boy knew how to crawl up my shoulder and sat under my hair. I was amazed and very careful. I let him stay there for a little while. And he bruxed! I couldn't believe it, but he does have teeth. Then later I held him with another boy and they both bruxed. I put in that wooden house thing so that Willow could "escape" from her youngins once in a while. And when I went in there this morning, she was on the house. So I put her in with her sister for a longer time. I played with the little ones for a while. I gave them some unsweetened dried pineapple and mango which they loved licking. Some of the bigger ones actually nibbled a little. I watch closely to make sure none of them took a bite that was too big for them. It was funny to see that I had three pieces next to the three that were interested but they haven't learned yet to share or know that each had their own. So all three were attached to one pineapple piece. After Willow had time to play with her sister and take a short nap, I put her back into her cage with some of the fruit on top of the house all for her. But she decided first that she had to check the babies. Of course, they were wandering and Willow made it clear that she wanted them in one corner by retrieving them and sticking them back into the corner. Then she jumped up onto the house only to be followed by a hooded baby. What a surprise. I think it startled Willow too. But then it fell off onto the paper towel pile. The three hooded babies seem to be the stronger and bigger of the 9. They are certainly more forceful at getting food from Willow. Survival of the fittest I guess. But I am making sure the littler ones get Mom food time and now that they are starting to eat adult food, I can make sure they get enough.